New Jacket from Motoport! The Marathon. Discussion in 'Equipment' started by Repko, Jun 28, 2009. This is a new style similar to the best selling Ultra ll. The changes are as follows. Shorter sportier look with same pocket volume as the Ultra ll 3/4. Upper right pocket for Maps, glasses, garage opener lower outside. Upper left phone & I-pod. Standard cargo lower pockets. Belt in back for more pocket volume. 1" Day-Glow sleeve reflectors, 3" back. 10" sleeve vent-zippers. 16" back. Shorter front for no bunching when seated. 2" longer in back all the way to the seat. 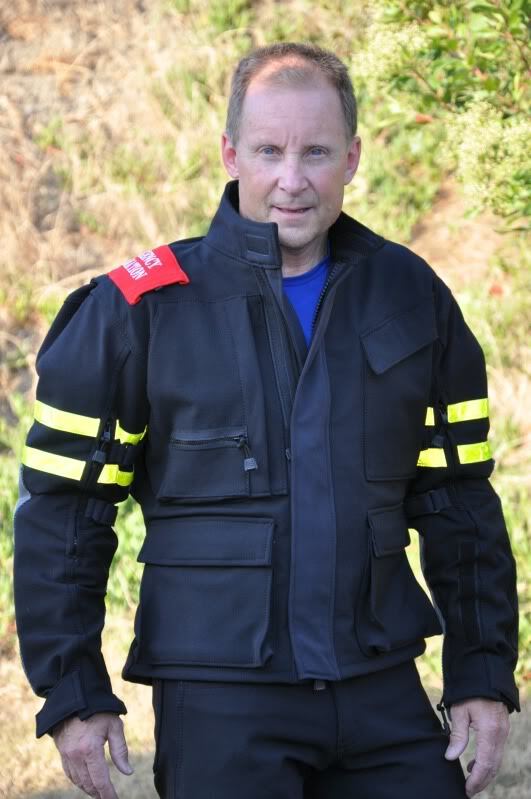 I believe after much experience with riding gear, this jacket is the finest toughest, most armor, best laid out, longest lasting, cool breathing, stretchy comfortable, great visibility jacket ever. For anyone new to Motoport, the materials used are the best available! (see save your hide on the site) Stretch Kevlar (Keprotec) is the most indestructibly material available today. Made by schoeller. Warrantied to be repairable after ANY accident, or replaced! Hand made in the USA! These are the first pictures. Request the Marathon @ about the same price as the Ultra ll. looks like the jacket from my 2pc Roadcrafter !!??!! It may just be the pics, but that collar looks way better than I'm used to seeing from Motoport. And the jacket actually has, dare I say, a bit of style. It certainly looks less frumpy. I really like that design. I have the Riva AX and since it's a short jacket, it has to be zipped to the pants. Since this is longer, do you zip this jacket to the pants? The only nit I have with this design is that the collar looks too tall and needs to be cut lower in the front for folks with a short neck like me. Being custom though, I suppose Wayne could do this if needed. Otherwise, this a great design! Let's see pics of you wearing it on your bike - you know, like Gringo. Thanks for the pics. Was 80% sure I was going to get a Motoport for next year, but seeing as I already own a generic frumpy jacket it was hard to spend that much for better protection but still look the same. Think the one you have there is the change that will convince many of us. Looks ooooooh so cool in the summer sun too. That is one awesome looking jacket! What is the armor made of? Is it in just the traditional places? Does it breath well? The collar is made any size, it's very soft material & folds down with helmet. Yes it's water resistant, it beads off like it's Teflon coated. I believe the Fabric guard 303 Motoport sells will "re water proof" after several washes. I don't have zippers for attaching to pants but may be a good idea. The upgraded back armor is stiff & feels like it would hold the back of the jacket inplace, zippers are always better though. I'll get some more pix soon. The short style is for no bunching when seated, back just hits the seat. It's a great design. I have liners but rarely use them. The Motoport site has all the information. I'm just an enthusiastic customer that got the first of a new generation design jacket. Same great stretch Kevlar material. Summer sun? the material does not transfer heat like Polyester or Nylon. Breathes better than the average cotton jeans too! Way better. 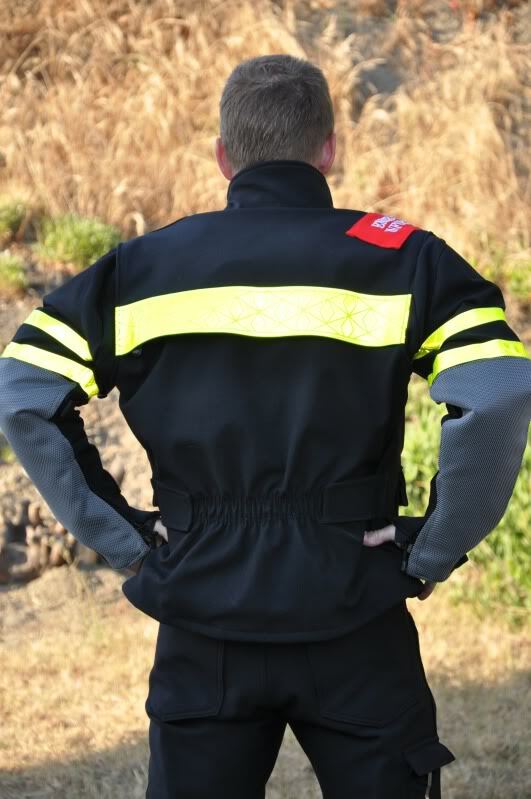 What kind of material is that on the back of the arms, mesh kevlar or something else? am i dumb or is it not on their website? These are the first pictures, not on the web site yet. I just use a rainsuit over my Motoport gear. I wouldn't want a waterproof layer on all of the time because I would surely overheat. Wayne said today,he is adding this to the web site. The Mesh is Kevlar on the back of the arms. (over kill & not needed) The standard stretch Kevlar is very tough! The material beads off water when pored on it! Retreat with Fabric-Guard 303 that's sold on the Motoport site. Seems silly to me to be sweating to death in rain gear all the time. If it's going to rain, put in the liner before you leave home. No need to pull over on the side of the road. Even with the liner installed "just in case" the Motoport gear is more comfortable in hot weather than Fieldsheer Tour Temp or the Roadcrafter from RiderWarehouse. I sure like the look a lot better than most motoport jackets! How well does it breathe compared to the AirMesh Kevlar? Would it be a good jacket for REALLY Hot weather? its tough to get really comfortable in REALLY hot weather..... even though the stretch kevlar breathes very well but when its really hot there is only really hot air coming thru..... the only way i've found to be SUPER comfortable in REALLY hot weather is to wear an evaporative cooling vest (the kind you run under a faucet) under my Riva stretch kevlar jacket....IMO in REALLY hot weather the vest is the best thing since sliced bread..... the stretch kevlar lets just the right amount of air thru to let the vest work properly.... it's air conditioning for a motorcycle ! Wayne & I had disused a new style jacket for some time. I brought 4 jackets with me & discussed details from each. BMW RP2, BMW Comfort shell, Dainese Fluxes & a Shift dirt jacket. I had printed pictures of what's called a Statesman jacket too. The basic shell is the Ultra ll, the gussets behind the shoulders run the full C shape to allow for forward reach-180 to the front of the top shoulder unlike the R/C witch stops under the shoulder armor. The velcro tabs in back were from the Dainese-Fluxus & the Statesman jacket, the scrunchy was from the Ultra ll. I wanted front cargo pockets like the RP2. The right chest pkt is the same Napoleon style used by many including & RP2 & Santiago & Motoport, M/P mostly covered it with a cargo pkt, we removed the cargo to give a cleaner look. The left does not have the glove pass through like the R/C. Arm vents extended to 10" from 3". Collar higher but using soft material as to not interferer with head turning. The sleeve mesh looks R/C but is my req & not standard. The front of this jkt is short waist as to not bunch up! tapering to 3" longer in back to look like a 3/4 from the back. Also hits the seat just right. The back vent is a old idea but taken from my Shift jkt & the "Statesman" look. Sleeve reflector rings to give a bold look & be seen from all angles. The original idea was a Statesman style witch has a "cape" wrapping over the shoulders & down to the flap in the back. I wanted mesh vents under cape, on the front of the shoulders. Hard to describe but was deemed way to radical & costly to make. 1.The primary idea with this style is to get maximum pocket volume by eliminating the front belt. 3. Give a 5/8 or 3/4....9/16th??? look to the back. 4. Provide a all-around jacket for all riding. 5. Provide very good daytime viability, not just night! Thanks for the interest! This was a fun project.